Pack Light and Travel in Style. Channel Nines’ 60 Minutes recently showed a documentary on Patagonia, and if you got the chance to view it my guess is that it took your breath away! In February I returned from my first trip to Patagonia, and I found that it is a place that makes you feel as if you are on another planet. The scenery and glaciers are incredible, and the wildlife and hiking trips are unforgettable. 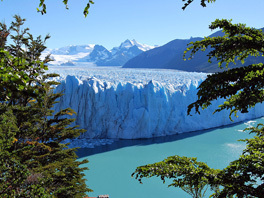 Patagonia was far beyond my expectations, it completely blew me away, and I am sure you will experience the same thrills when you join our next tour departing February 2015. In the past there have been many articles on travel and "what to pack" especially for women. Let's face it, men only need to pack the bare essentials, even though compared to us their body weight can be between 5-10kgs more, and be approximately 11cm taller! Many of my clients say that working out what to wear on the flight stresses them out. As someone who hops on and off planes quite often, I have figured out exactly what my needs are. I also wear loose fitting trousers or a long skirt, and flat shoes. I always wear the same outfit on departure as arrival, as I know is the most comfortable outfit, and it saves packing another! So now that we have the essentials for ‘in flight’ packing and comfort lets move on to the big stuff. Many of my client’s say that working out what to wear on a trip stresses them out, so they leave it to the last minute to pack, and then when they arrive at their destination they might realised they have packed outfits for summer when its winter! This would be a disaster for a woman, so on my last trip I decided to take the advice of a professional. The advice was that I needed a “what-to-pack checklist”. Did you know that there is a free app called ‘Evernote’? It syncs to all of your devices and you can add/amend your list each trip until you have it to perfection. This saves all the worry of forgetting something. Another great tip, (although it can be time consuming) is to lay out each outfit day/evening on the bed, including jewellery and shoes, then take a photo on your phone, this way you can refer to the photo when you are ready to go out! It can also save time and stress of rummaging through your suitcase not knowing what piece of clothing you are looking to wear. When packing your outfits, consider whether or not you need a jacket, cardigan, shawl AND coat! All of these items together can be bulky. Work out what you need then work out what would work best with multiple outfits. Similarly, shoes are a nightmare and the heaviest to pack. So choose outfits that you can wear with the same couple of shoes, there is nothing worse than having a lovely outfit, and all you have are trekking boots or sandals that don’t match! Choose suitable jewelry that you can wear with several outfits, pack each piece in a zip lock bag and store together with your outfits. Roll all of your clothes instead of folding, it alleviates the crushed look! If you are going out the night you arrive at your destination pack those clothes on top including accessories. When packing, separate your clothes into see through zip lock bags, take plenty of extras for dirty washing, wet costume or leaking liquids and creams. It’s also a charming to pack a small scented candle so that when you arrive at your accommodation you can light the candle and take a nice hot bath, to calm your nerves and collect your thoughts after the big trip! I hope these have helped you and sparked some ideas; I know they have saved me a lot of time and allowed more room for gifts to take home! The main thing is to feel comfortable and calm, so pack wise and pack well and you’ll have a wonderful trip. Some of the most hauntingly beautiful places in the world are found in Patagonia, making this area a favorite one for visitors from all over the world. 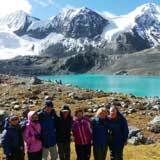 In this tour, we will travel far beyond the usual tourist routes into an amazing array of landscapes where you will experience the contrast between beautiful turquoise lakes, moving glaciers, enormous granite towers to lush forests. Copyright © 2014 Lyn Taylor's Adventure Travel, All rights reserved.